Looking for some ideas for late, great Summer Nights outdoors? This weekend temperatures are set to soar as summer returns with a roar. 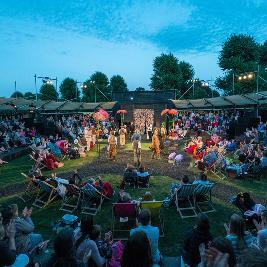 So what better way to enjoy the rising mercury than to pack a picnic, fill an icebox with champers and head off to one of the UK’s glorious parks and gardens for some inspirational open air theatre? From Sing-a-longs to Shakespeare, brush up on your bard and enjoy some unforgettable entertainment beneath a blanket of stars…. A charming amphitheatre-in-the-park. This August’s season ranges from comedy to gothic horror with outdoor performances of Much Ado About Nothing and Frankenstein and on into a swashbuckling September with Treasure Island. Performances run until 29 September and always finish by 10pm. Chapterhouse Theatre Company is touring a spellbinding season of romance, magic and mystery with six wonderful new open-air theatre productions including The Railway Children, Peter Pan and Sherlock Holmes. From beautiful Corfe Castle in Dorset to Cumbria’s Lanercost Priory, there’s sure to be an event near you. One of the UK’s finest open air theatre companies and the only one of its kind outside London. The 2016 season runs until 21st August and highlights include As You Like It, The Two Gentlemen of Verona and children’s favourite Stig of the Dump. From 16 August to 11 September, tap away your troubles with the infectiously optimistic Thoroughly Modern Millie. Kilworth House Theatre lies in a beautiful wooded glade beside a lake with an auditorium seating 550 on comfortable padded seats. Sail-like canopies protect theatregoers from adverse weather. The Lord Chamberlain’s Men is an open-air theatre company whose aim is to thrill, delight and captivate the nation from Chichester Cathedral and Glamis Castle and almost everywhere between. Join them this summer for Much Ado about Nothing. Performed by an all-male cast with Elizabethan costume, music and dance. One of the world’s most spectacular amphitheatres. 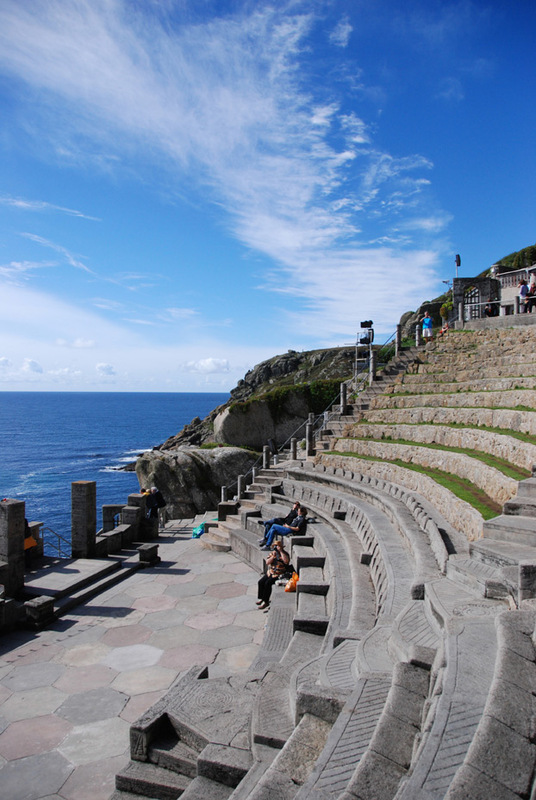 Cornwall’s Minack Theatre season runs until October and features professional and amateur performances including The Clockmaker’s Daughter, The Merry Wives of Windsor and The Crucible. Oxford Shakespeare Company shows are designed to interact with their environment and to allow the audience to enter wholly into the world of the play. This season, Love’s Labour’s Lost uses skilled actors, sensational costumes and live music which has been specially devised for the production by Nick Lloyd Webber. Until 19 August. Set within London’s beautiful Regent’s Park, this open air theatre casts a cloak of magic over summer evenings in the capital. Expect the kind of production values you’d find in the West End this summer, as Jesus Christ Superstar and Pride & Prejudice hold the crowds in thrall as the sun sinks and the stars come out. The Wonder Season this summer from the Globe’s new Artistic Director Emma Rice features A Midsummer Night’s Dream, Macbeth, and Kneehigh’s 946. Seating often sells out, but why not go medieval – standing places in the yard cost just £5 and can be bought on the day. Red Rose Chain transports you to a world of magic and sorcery in Shakespeare’s supernatural spectacular, The Tempest. Perfect for all ages whether you’re coming alone or bringing the whole family. Shakespeare with a festival feel! Always remember that the British Summer can blow through four seasons in one day – take sun screen, water and pack a rug and a rain mac just in case…and of course some plastic cups for the champagne! If you’re looking for more inspiration for summer days & nights out, Dadbloguk.com has great ideas for family days out in London and around the UK. Or for something further afield join us for a tour of nature’s most incredible theatres. And finally…with Autumn just around the corner, now is the perfect time to book ahead for some great deals on top West End Shows!